In this post of mine; I am going to discuss about the tutorial to develop a CSS Image map with independent Diagonal Hover area. More over I had also explained the basic fundamental behind the concept so that you can easily use it or tweak it as per your design requirement. It is really an easy task to create two adjacent rectangular Image Maps but if we want to create separate Diagonal Hover area effect; the things becomes messy. To solve this situation we have two different approach but they both fail in some aspect. Adding diagonal images to the rectangular Divs- When we add diagonal images to the Divs; the visuals looks fine but when we hover the area; we still have the Rectangular effect (blank space) and hence this method fails. Fusing two Divs together- We can get the desired visuals by combining two divs together but it will raise the problem of Overlapping Area. The hovering link at the overlapped area will too be dominated by the div with higher Z-index and hence this method too fails. <div class="page"> <img width="964" height="182" border="0"
<a class="anos position our-site" id="chopper"
Hi! I am Dharmendra Bisht. 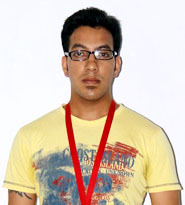 I am a professional web developer and currently working with Sparx IT Solutions. I am a tech enthusiast and love to expand the boundaries of possibilities. When not on my desk; you can find me playing snooker or listening to music. WoW!! it’s really great to see your efforts. Keep it up. +1 for your effort. …. Hey it’s really cool concept. I have to use your concept and it’s really working so thanks for sharing this concept. Dharmendra: This is mind blowing. Hatss off 2 u for your efforts.